1. I'm intrigued by a new novel called The New Moscow Philosophy by Vyacheslav Pyetsukh, originally published in 1989 and translated into several languages, but only now available in English in a new edition translated by Krystyna Anna Steiger and published by Twisted Spoon Press of Praque. ... As two tenants engage in an extended debate over the nature of evil, the take it upon themselves to solve the mystery and nail the culprit, and it becomes clear that the entire tableaux is a reprise of Dostoevsky's Crime and Punishment. Displaying a sharp with and a Gogolian sense of the absurd, Pyetsukh visits anew the age-old debate over the relationship between life and art, arguing that in Russia life imitating literature is as true as literature reflecting life. The author's authority on the subject of the great Russian literary tradition makes itself strongly felt, though the work feels a bit Kundera-esque and I must admit that so far I like the back cover copy better than the book itself (that happens often, in fact). But I'm sticking with it, and I think the book has a hell of a thesis. We know that Joseph Stalin was a big Dostoevsky fan. 2. The Brits know how to party. 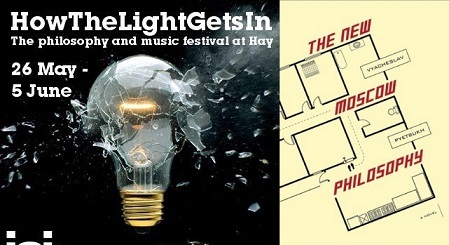 A blog post at Moby Lives alerted me to a Philosophy and Music Festival called "How The Light Gets In" that took place last month at Hay-on-Wye. Participants included A. C. Grayling, Bernard Henri-Levy, Lars Iyer, Henrietta Moore, Bryan Appleyard, Jonathan Ree, Polly Toynbee, Mark Vernon, Simon Critchely, Philip Pullman, Dany Cohn-Bendit, Cory Doctorow, Evgeny Morozov, Lauren Booth and, apparently, a whole bunch of experimental musicians. Impressive bill. This article is part of the series Philosophy Weekend. The next post in the series is Philosophy Weekend: Matt Taibbi Has Nothing To Say. The previous post in the series is Philosophy Weekend: Ayn Rand in the News (Paul Ryan, Adam Curtis). No Responses to "Philosophy Weekend: Pyetsukh's Book, A British Festival"